Calgary- Alberta Minor Roller Hockey’s annual recreation tournament moved to Calgary this year and took the city by storm. 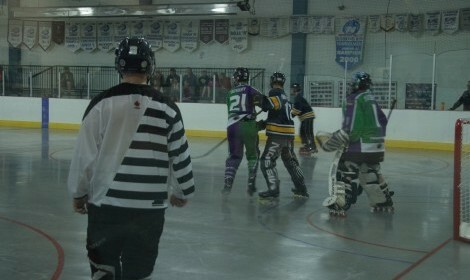 Over 500 people, 25 teams, and a horde of volunteers took over 3 rinks in Calgary. Teams of players from age 6 – 18 fought tight games, and endured run away games. The competition for the top spots was fierce! In the end 72 hours of roller hockey was played and there were winners and losers, but what mattered more than the scores were the teams that played better than they ever had before, the teams that really became teams and not just 10 people who meet once or twice a week to chase a puck around, and the friendships that were formed that will last a lifetime! Highlights from the weekend included the U 17 final – that saw the undefeated Didsbury Renegades win silver in a tightly contested game against Edmonton’s Team United. Then there was the unexpected Grizzly match that saw the Calgary Grizzlies edge out the Edmonton Grizzlies for the right to be called the Alberta Grizzlies and take home the Griz himself.